Jewish Home MK attacks own party over recommendations closing Mount to Jews after riots, letting Waqf charge tourists. MK Zevulun Kalfa (Jewish Home) strongly denounced the report issued by the Interior Committee's sub-committee on Jewish prayer rights at the Temple Mount on Monday. The recommendations essentially perpetuate the status quo on the Mount, by which the Jordanian Waqf (Islamic trust) enjoys a de facto rule and has banned Jewish visitors from praying. 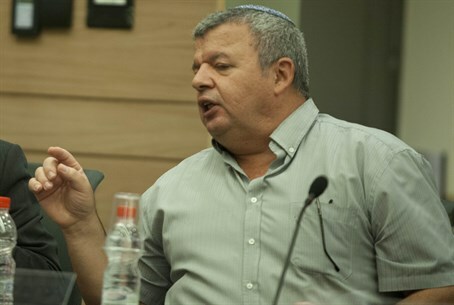 "I disagree with the recommendations, the committee should have discussed the rights of Jews to ascend to the Mount, and instead it recommended to continue the status quo," Kalfa told Arutz Sheva. Kalfa's criticism comes despite the fact that members of his own Jewish Home party submitted the committee recommendations. One particular failing of the committee according to Kalfa was the submission to Muslim violence in shutting the holiest site in Judaism to Jewish visitors following Arab riots. Indeed, the tactic has been used frequently, and Muslim riots two weeks ago shut the site to Jews three days in a row. "The committee suggested that if there are breaches of the public order on the Temple Mount, the Mount will be closed to all visitors, and I think that if there are disturbances by Muslims the Mount should be closed to them and not to Jews," argued Kalfa. Kalfa reported that the decision to open the Mount to Jews on Shabbat is a positive step, but too limited, saying "that's a good recommendation, but it's dwarfed by the other recommendations." "The committee recommended to allow the Waqf to charge money from tourists visiting the Mount, they reasoned that will give the Waqf motivation to keep the order and act positively, but we have to remember that the Waqf is very weak; those who rule the Mount today are all sorts of movements like Hamas and the Islamic Movement in Israel, who dictate the management," stated Kalfa. "In practice, the state of Israel is not the sovereign on the Mount," charged the MK. Back in April on the eve of Pesach (Passover), Temple Mount activists documented how Hamas members waving flags of the terror organization took control of the Mount, blocking Jews from entering. Last month, a senior Hamas terrorist was captured and revealed the inner workings of the organization, exposing how Hamas funds Muslim activists to block Jews from the Mount and start riots, paying them between 4,000-5,000 shekels (roughly $1,150-1,500) a month. Kalfa commented that in his estimation, the committee gave the Muslim rioters a prize in their recommendations. "It's no secret that the Muslim world is going through a very meaningful and radicalizing change. It can't be that at the Temple Mount, the heart of the land of Israel, we'll give the rule of law to the hands of Hamas and the Islamic Movement," stated the MK. Kalfa concluded with the words: "whoever breaches the public order is the one who shouldn't enter the Mount; in the status today, the sinner is the one who benefits."